There are no surprises in the weather forecast for the final round of the F1 world championship at the weekend. Yas Island has a desert climate, but in November it is well past its the peak temperatures of up to 49C seen in the Summer months. A typical November day sees air temperature in the mid-20’s, though it is likely to be a a bit hotter this weekend. Friday is forecast to be the hottest of the three days, reaching 30C, while the following days will be a couple of degrees cooler. The drivers are spared the worst of the heat during P2, qualifying and the race, all of which take place at nightfall. These sessions each begin at 5:00p 1/2 hour before Sunset. This means the race track temperatures are usually in the high 20’s, around 10C cooler than in 1st and 3rd FP, making those 2 sessions less useful for the teams in terms of getting their cars set up. The track was built on a man-made island at a vast cost, reputed to be as much as $1-B when it was finished in Y 2009. But despite having a blank canvas and no shortage of funds, the resulting track is one of F1 least imaginative and challenging. The track has 3 purpose-built slow chicanes. Tight corners lead into yet more tight corners. There are 2 long straights where drivers can press their DRS buttons. The few quick corners on the track have a fairly low entry speed and are likely to pose little challenge to the current generation of cars. .
Pirelli has again brought its softest range of compounds. 1-pit stop strategies have been standard at most races so far and with few quick corners to put the tires under severe stress that will probably by the case again this weekend. The drivers’ title is settled, and so are the Top 4 places in the constructors’ championship. F1 champion Lewis Hamilton will want to sign off his 4th title-winning year with another win. But a 2nd straight victory for Sebastian Vettel would see Ferrari end a promising but disappointing campaign on a high. What’s more, it would be their 1st ever triumph at Yas Marina. It has been a frustrating venue for The Scuderia, as they have never won there. The Yas Marina circuit sits next to the Ferrari World theme park. The Big Q: Could Mr. Vettel be the driver to end Ferrari’s Yas Marina drought? Ferrari’s (NYSE:RACE) Kimi Raikkonen, is the only driver from the Big 3 F1 racing teams not to have won a race this year. If he fails to win Sunday his win-less streak will have reached 4 years by the start of next season. Mr. Vettel’s 22-point lead over Valtteri Bottas means he is unlikely to be beaten to 2nd place in the drivers’ standings. If he takes it, it will be the 1st time under the V6 hybrid turbo regulations that a MercedesAMG driver has finished behind a rival from another team in the standings. The Big Q: Does that matter to MercedesAMG? The Big A: We may find out if Mr. Vettel drops out and Mr. Bottas is running 2nd to Mr. Hamilton. If Mr. Hamilton finishes in the Top 10 he will become only the 2nd driver in the history of the championship to score points in every race of a season. Michael Schumacher did it in Y 2002 when he finished every race on the podium. Juan Manuel Fangio scored points in every F1 race in Y’s 1954 and 1955 but not in the Indianapolis 500, which also counted towards the championship back then. There are closer championship fights going on between team mates at this final race of the year. Felipe Massa, heading into retirement again, has a 2-point lead over Lance Stroll. Sergio Perez looks set to clinch the best-of-the-rest spot in the championship. “Finishing just behind the Top 6 drivers makes me feel proud,” he said ahead of this weekend’s race. But he still needs watch team mate Esteban Ocon who, if things fall his way, could still overturn the 11-point gap between them. However Mr. Ocon would need to repeat Force India’s best result of the year so far with his team mate no higher than 10th. While much of the action will be on-track, there will be loads of entertainment and activities happening off-track as well for the entire family throughout the four Oasis areas. Ardent F1 fans will be able to get close to their favorite teams during Thursday’s Public Pit Lane Walk followed by the daily autograph sessions with drivers. Another highlight will be the new F1 Driver Fan Forum, the F1 GameZone, live music, dance performances and street theatre among other things. The Yas KartZone will also stay open throughout the race weekend, exclusively to F1 ticket holders, while ticket-holders who want to experience the rush of the F1 circuit, can experience Yas Hot Laps in a Jaguar F-type or in a Radical SST. 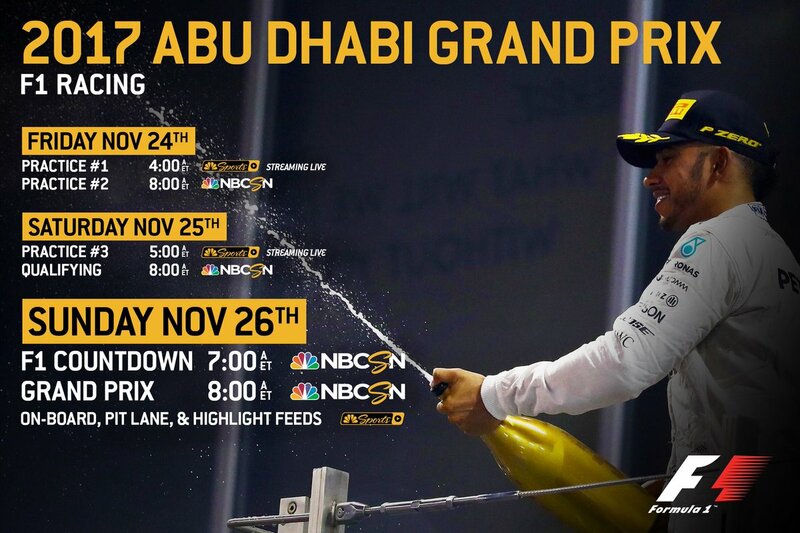 This weekend’s Abu Dhabi Grand Prix will be the 98th and final F1 race to be carried by the NBC Sports Group. The last 5 years have been among the most important in F1 history with the changes in power both on and off the grid. Tune in and enjoy the racing this weekend.